This short documentary focuses on the issues faced by Haitian migrant women living in the Dominican Republic. Many Haitians cross the island of Hispaniola to the neighboring country with the hope of finding a better life. As migrants they become a particularly vulnerable population that is often discriminated against, exploited and whose human rights are violated. 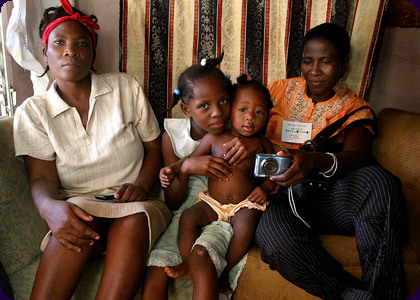 The Haitian migrant women were taught by industry professionals to use digital cameras and audio recorders to become efficient storytellers in their communities. Deborah Acosta is a multimedia journalism graduate student at the University of Miami. She specializes in video and audio production, Web site production and documentary-style journalism. She's currently working on editing her thesis documentary, which she shot and produced in Havana, Cuba. Irene Carolina Herrera is a photographer, documentary filmmaker and journalist with more than ten years of experience working on projects in Venezuela, Brazil, Spain, France, Miami, India and Japan. Through different media, Irene continues to comment on issues of human mobility, displacement and identity. At Temple University's Japan campus as a full-time assistant professor, Irene teaches courses on production and the history of documentary filmmaking as well as cinema and media studies. Alessandra Villaamil is a University of Miami undergraduate student studying visual journalism and French. Through the Knight Center, she has worked on several projects, including an ecologically sensitive story in the Czech Republic focusing on green power alternatives, a project in the Dominican Republic giving undocumented Haitian women the power to tell their own stories, a warm up to the 2011 Special Olympics in Greece and various national parks stories in the US.